뮌헨, 독일의 옥토버피사 - 옥토버페스트 캠프사이트 | 호스텔월드에서 예약하세요. The original Festanation Campsite, the best and hottest festival campsite at Oktoberfest! We will give you everything you need (and more!) for a wild, social and unforgettable Oktoberfest experience. We offer basic dorm & private tents for backpackers, including sleeping materials. We have a great location, next to the subway which allows you to travel to Oktoberfest really easily and fast. 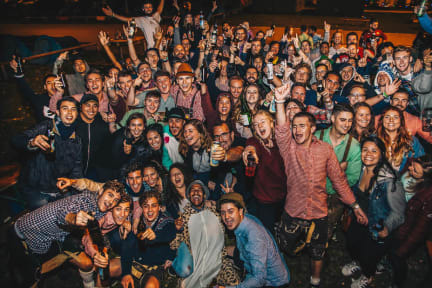 Our camp is all about affordable accommodation, meeting other travellers and experiencing the Oktoberfest in the best possible way! We also offer free Oktoberfest-tours! The Festanation Oktoberfest Campsite crew will check you in with a big smile on our faces upon arrival, where the tents will be waiting for you already set up, including thick comfy air mattress and sleeping bag. On departure day you just take out your stuff and we clean up the mess for you! We have our own common breakfast area, including a nice terrace with picnic tables. You can enjoy your own beers & booze over here, play beer pong & other fun games and obviously party before and after Oktoberfest. There is also an actual big wooden party-chalet that holds the campsite restaurant & bar. Here you can get tasty German beers and enjoy typical German food. In the morning a simple, tasty breakfast & hot coffee will be waiting for you and your (new) friends. Enjoy your breakfast at our picnic tables in the sun and make a new game plan for the day! 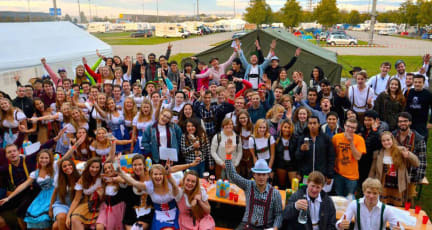 What is the Festanation Oktoberfest Campsite about? - Free tours to Oktoberfest & social activities. - The camp offers clean shared bathrooms & warm showers. What is the Festanation Oktoberfest Campsite NOT?